From Abracadabra to the Avada Kedavra and Rennervate used in Harry Potter, everyone has become familiar with magic words; but novels, films, and comic books can provide only a simplified, distorted version of them. Shouted, whispered, chanted, recited, or muttered by a magician, wizard, or witch--using singular and even incomprehensible words to obtain supernatural effects--these perpetually evolving spells come down to us from the dawn of time. Thanks to the efforts of the scholars from a variety of disciplines, we now have a corpus consisting of tens of thousands of accounts at our disposal that can be found in charms, orisons, blessings, conjurations, and medical prescriptions. One of the purposes of magical phrases and words was the protection of people and property. It involved the prevention of something from happening or halting an action already at work. Then there are the spells intended to grant one’s wishes. These range from desires for wealth--through the discovery of hidden treasures!--to catching fish, to winning the love of a person one lusts after.That the phrases may have been incomprehensible was of no importance as their use was based on an act of faith, relying first on the magic and authority of the text, then on the tradition. If they have been handed down, it is because they work, and the more impenetrable they seem, the more effective they are! To write magic words or phrases, we are sometimes told it is necessary to use one’s own blood or that of animals--the most often cited animals are bats, cats (preferably black ones), roosters, and dogs. Ablanathanalba: A word that means “You are our father,” endowed with magical properties and commonly used on Greek amulets and papyri. One on the collection of the National Library of France (n° 177) depicts an armed spirit with serpents for legs and a rooster’s head over the palindrome Ablanathanalba on one side. On the opposite side there is a winged god standing on the back of a reclining lion with magical letters. This was all intended to protect the bearer from fear. A Greek papyrus or curse tablet dating from the second to fourth centuries places it at the top of a series of words arranged in a triangle that shrinks one letter every line: ablanathanalba; aeêiouô; iaeôbaphrenemoun; ôuoiêea; akrammachamarei. It can also be found in a Greek charm for obtaining victory in the phrase ABLANATHANALBA AKRAMMACHAMARI PEPHNA PHO’ZA PHNEBENNOUNI NAACHTHIP...OUNORBA. PGM XXXIII, 1-25; XXXVI, 211-30; D. G. Martinez, PMich 757: A Greek Love Charm from Egypt, Ann Arbor: Univ. of Michigan Press, 1991; A. Mastrocinque, “Metamorfosi di Kronos su una gemma di Bologna:” A. Mastrocinque (ed.) Gemme gnostiche e cultura ellenistica, Bologna, 2002, 118. Abra: Word of a spell intended to provide protection against a dwarf who was believed to transmit illnesses. Abra Iesus, Alabra Iesus, Galabra Iesus. This phrase is preceded by the equally widespread thebal guttatim. Berthouin-Mathieu, 155; Deonna, W., “Abra, Abraca. La croix talisman de Lausanne,” Geneva 22 (1944), 115–37. AB : RA : CA D.A: --B. R: A.: To chase away a cold fever, these words are written on a piece of bread that is then given to the patient to eat. The letters form the word Abracadabra! Abracula/Abraculus: A word featured in a reductive phrase intended to cure fever. It should be written on a note to be worn around the neck. It appears in a wide variety of ways in the manuscripts. 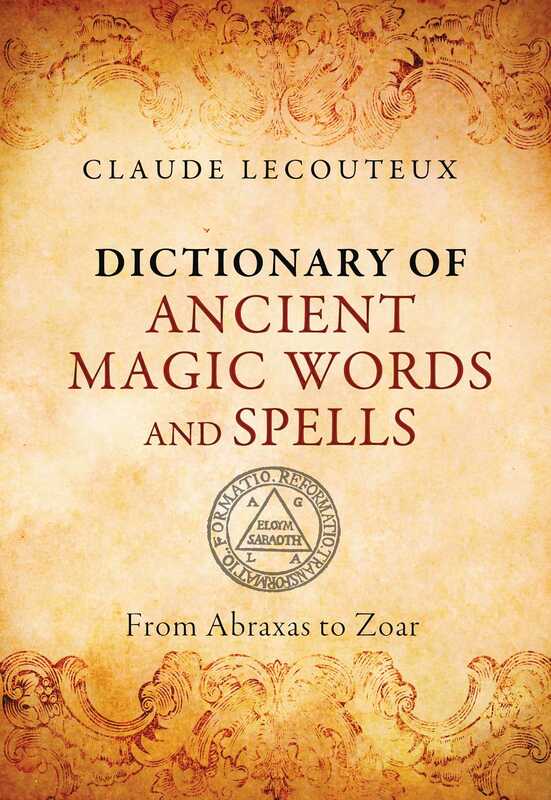 "Lecouteux has analyzed more than 7000 spells from numerous magical traditions. We find spells for protection, love, wealth and healing, with a charted evolution showing how a spell can morph down through the centuries. Presenting a wealth of material on magical words, signs and charms, Lecouteux also explores the magical words and spells of ancient Scandinavia, the Hispano-Arabic magic of Spain, the ancient Egyptian traditions and customs that have stayed in use until the present day."